Google Home vs Home Mini vs Home Max: which smart speaker is for you? With the dust now settling on Google’s host of new hardware announcements, it’s time to take stock of where the Google Home family of devices has ended up. There are now three official Google Home devices. There’s the original Google Home speaker, which was announced back in 2016, and the newly announced Google Home Mini and Google Home Max. Prior to the event there were rumors that Google might be preparing to announce a screen-equipped Google Home in much the same vein as Amazon’s Echo Show, but the rumored device was nowhere to be found on the evening itself. However, with three first-party Google Assistant speakers you now have a lot of choice if you want to get the search giant’s voice assistant into your home. Here’s a rundown of how the three speakers compare. The three speakers sit at radically different price points. The Mini is the cheapest of the three, and costs just $50 / £50 / AU$79, which is identical to Amazon’s budget Echo speaker, the Echo Dot. The standard Google Home, meanwhile, costs $130 / £120 / AU$199. Finally, the premium Google Home Max was announced as having a price tag of $400 (around £305 / AU$510), which makes it the most expensive first-party smart speaker around, more costly that even Apple’s premium-styled HomePod which is set to cost $350 (around £265 / AU$450). Although the three speakers follow a similar design template, mixing clean plastic with colored speaker meshes. The small Home Mini is available in three colors, black, grey, and coral (aka pink). Underneath the speaker mesh are four lights that illuminate to show that the speaker is listening to you. The standard Google Home speaker features a white plastic shell sitting atop a colored speaker mesh. Different colored bases are available if you want to customize the speaker to match your home, although by default the speaker comes with a gray mesh. Its listening lights are located on the top plastic of the device. Finally, the Google Home Max is available in only black or white, with its four listening lights being located underneath the speaker mesh on its front. The Max is, as its name implies, a much larger speaker than either the Home Mini or the Home. Although it’s got rounded corners, the speaker is much more rectangular in appearance, and includes the option to be mounted vertically as well as horizontally. Due to their varying size constraints, the three speakers are equipped with radically different quality speakers. The Google Home Mini has the most basic speaker setup of the three. Google advertises its 40mm driver offers ‘360-degree’ audio. In our hands on time with the device we thought it sounded clear enough, though it was definitely lacking in bass. Things get a lot better when you move up to the standard Google Home. This speaker features dual 2-inch passive radiators for some added kick in the bass, and it pairs this with a 2-inch driver. 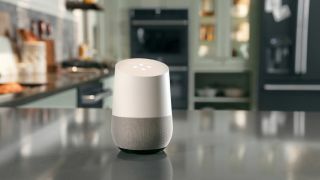 The Google Home Max offers the most substantial audio quality of the three, and it achieves this through a combination of hardware and software. On the hardware side, the new speaker features two 4.5-inch woofers, and multiple tweeters. Google is yet to confirm the exact specifics of these drivers. On the software side, the Max also has content covered with a free 12-month subscription to YouTube Music. It also features Google’s room-sensing technology called Smart Sound, which apparently optamises the speaker to sound the best it can in whichever room it’s located. The technology sounds similar to what Apple is promising its upcoming HomePod is capable of. Suffice to say, when it comes to sound quality, it looks like you’re going to get what you pay for. Aside from differences in hardware, the three speakers will offer near-identical access to Google’s voice assistant. As such, you should be able to happily buy a Google Home Mini safe in the knowledge that it will be able to control your smart lighting just as capably as the premium Google Home Max. The difference, it seems, is in how likely you are to want to use the speaker to listen to music. If you want a smart speaker that’s going to mainly be used for setting timers and hearing the weather, then you can save some money with a Mini, while the Max should prove more than capable of being the centerpiece of a party. Of course, you could always buy one of the numerous third-party speakers equipped with Google Assistant that have been popping up all over the place, including the Harman Kardon Allure and Panasonic SC-GA10. Google also announced a pair of phones at the same event, the Google Pixel 2 and the Google Pixel 2 XL.